Strictly speaking, this isn’t really a Weekly Window Shop at all, is it? Because – even though I did spend rather a lot of time faffing around putting things in and out of my online baskets – I ended up buying it all. Which takes it from “window shop” to (one of my most-hated words) “haul”. Whatever, it’s all safely in my possession now and I’m just trying to work out how to gradually reveal the items one by one so that Mr AMR doesn’t realise the extent of my online shopping problem. I’m hoping that if I just slip the cushions onto the spare bed and the bathmat into the top floor bathroom, he’ll be none the wiser. The mirrors can be boldly presented to him in a ta-da! sort of fashion, because he’s been desperate for a mirror. Until now we’ve had none – all of the mirrors in our old house were built in to various walls and cabinets – and he has been shaving using his reflection in the downstairs toilet window. Because of the need for mirrors, I became quite obsessed with finding the right ones and so we now have no fewer than six of the blasted things boxed up in the hallway, most of which need to go back because they’re not quite right. Mirrors are weird objects, aren’t they? I mean, you’d think that they would be very simple to choose, but actually they become quite the focal point once they’re hung on the wall. Then – especially with bathrooms – you’ve got the problem of location, because they need to be high enough to see your whole face in but not too high, hung miles above the sink, where they look silly. And what do you match the frame to? The white sanitaryware? The steel of the taps and the shower trims? Don’t match it to anything at all? Anyway, all nice decisions to have to make. Do you want to see what I bought? A bit of a splurge – I’m going to have to rein it in for a few months now! 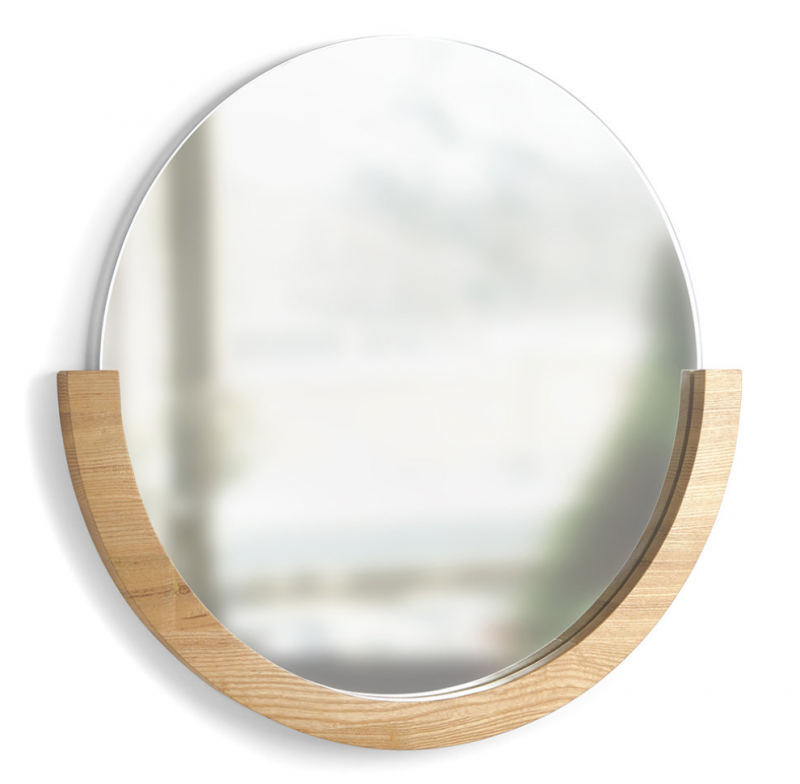 Umbra Mira Mirror, £60 at Amara here*. I searched high and low for a round mirror with a light wood frame (oak, or similar) that didn’t look boring. The top floor bathroom – in total contrast to the main bathroom – has light-ish wooden beams (I’ll do a bathroom tour when I get around to it!) and the sink rests on a sort of wooden frame with a solid stone top and a slatted shelf for storing towels. Also oak. (I think.) Anyway, I found the Mira mirror and instantly loved it – the part-frame detail is just what I didn’t know I wanted. Adds interest, looks chic, ties in with the rest of the room. Job done. 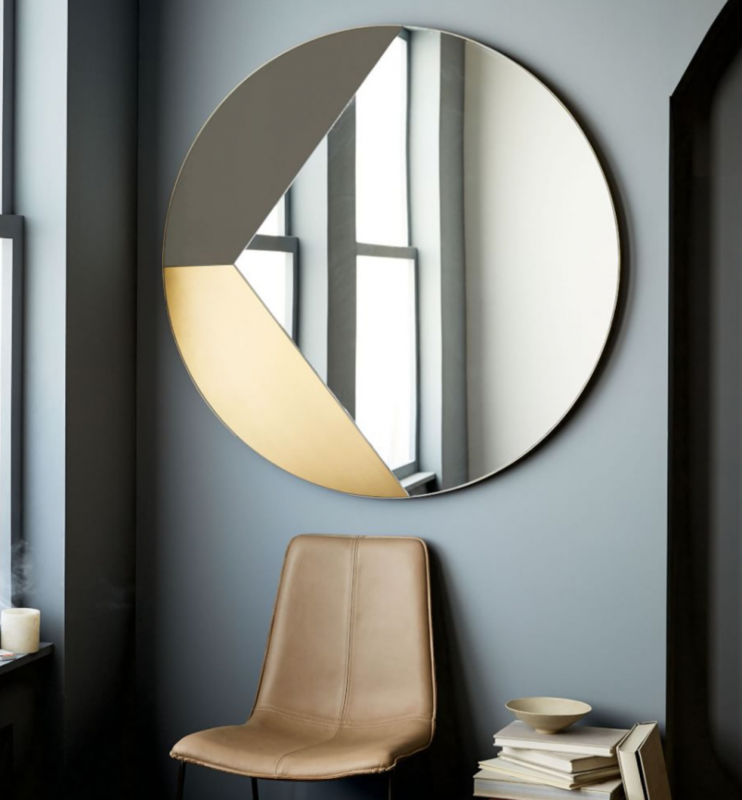 West Elm Geo Shapes Wall Mirror, £449 here*. A bit of an extravagance, but this mirror is properly amazing. I have no idea where we’ll put it – it’s very large, but not large enough for the wall in the hall – so no doubt it will stay in its box for a while, gathering dust and presenting a potential safety hazard for whoever tries to shimmy past it to get stuff out of the understairs cupboard. 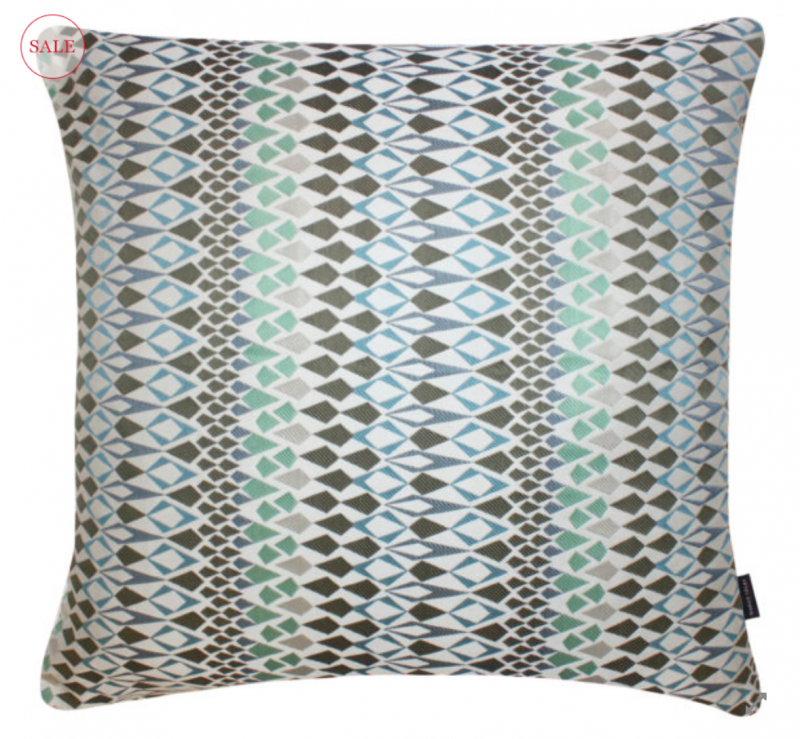 Margo Selby Ashdown Cushion, £38 reduced from £84 here. At the start of every year, Margo Selby does the most amazing sale of older stock. 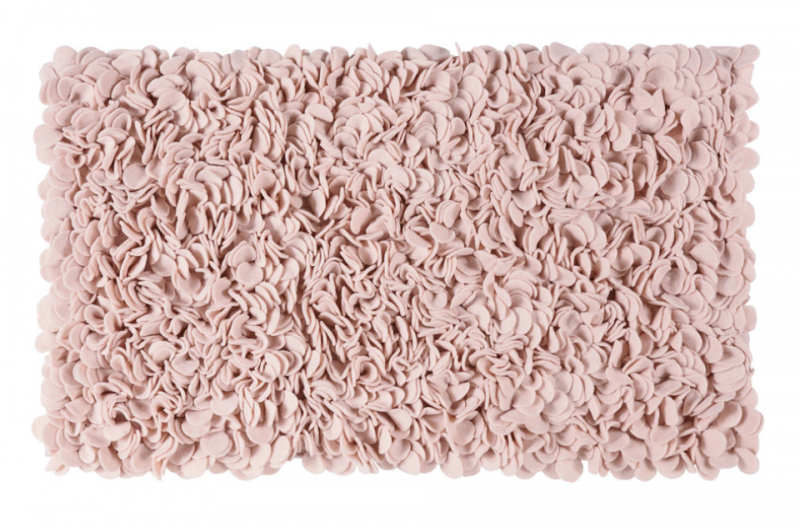 She does incredible fabric prints on everything from cushions to carpets – her range for the brilliant Alternative Flooring Company (here) would be the ultimate indulgence for anyone looking to go totally carpet crazy in their house. (I’m honestly thinking about it!) For smaller doses, the large cushions in the sale are great value and they come pre-stuffed with big, squidgy pillows. 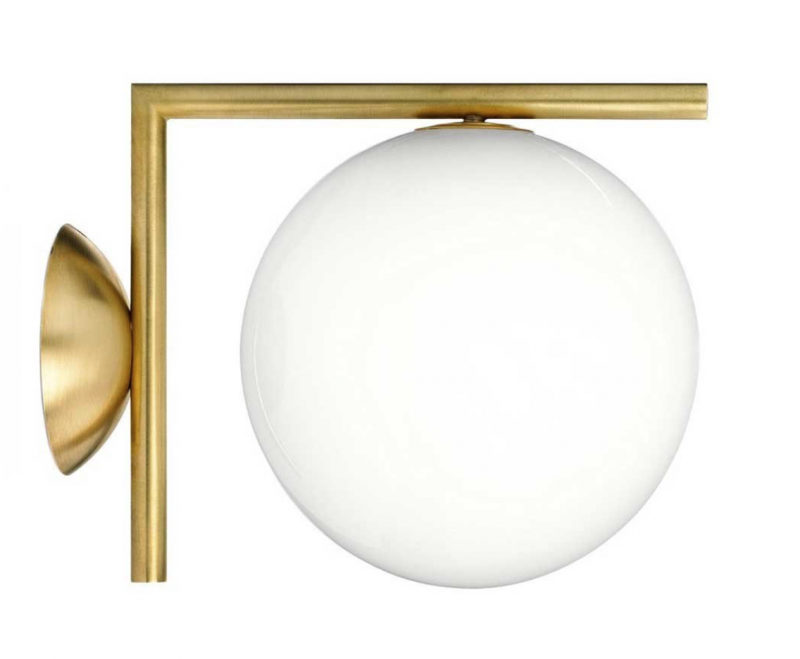 Flos Wall Lights, £280 from Heals here*. Crumbs. These were a bit of an outlay (we needed a few) but we wanted something very modern but elegant for the living room. It has high ceilings and beautiful coving, two original fireplaces and very dark wooden floors and so we wanted something that would link the elegance of the room to the mid century modern furniture that we love. Flos lights are just classic – simple shapes but with an exquisite attention to detail. These were a no-brainer for me – I had my eye on them before we’d even exchanged contracts on the house! 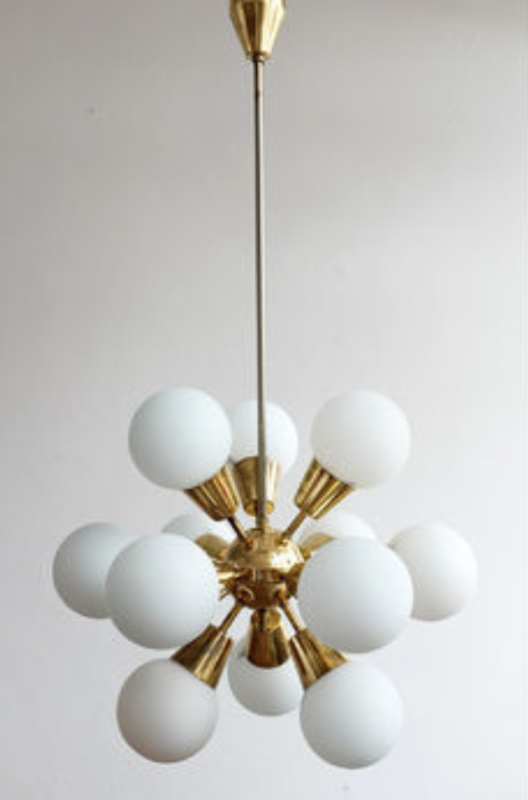 Mid Century Sputnik Chandelier from Vinterior. 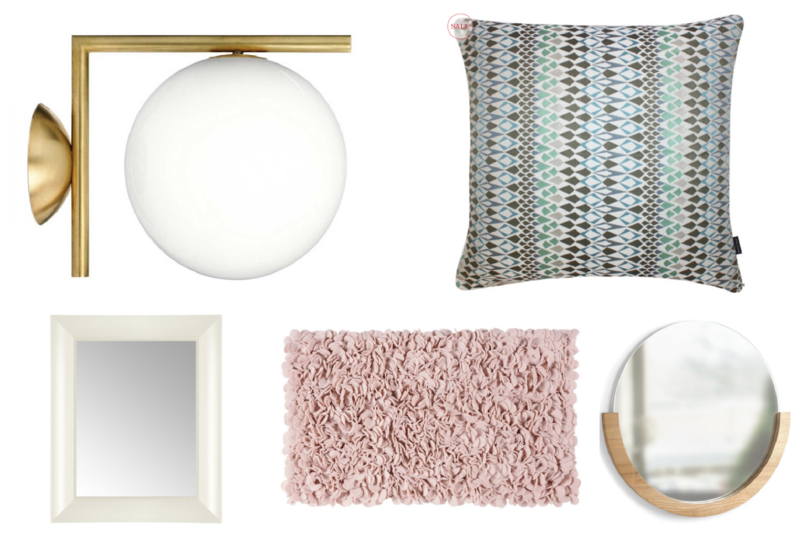 I’ve spent hours on Vinterior – it’s my new favourite website for mid century finds. They bring together lots of dealers, so they are more a “platform” for sales rather than an actual shop, but it’s very well curated and so stylish. Really a joy to browse. I’m nervous about this chandelier as it’s pretty huge, but I want some sculptural, eye-catching lighting for the high ceilings and I think this will look great. Fingers crossed. 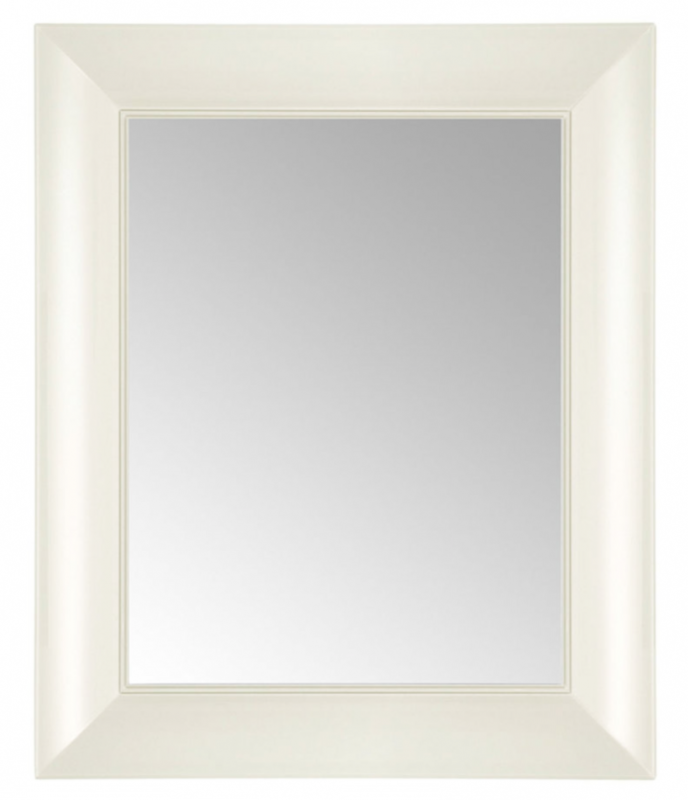 Kartell Francois Ghost Mirror, £235 here*. For the main bathroom. It needed to be classic but with a modern edge and this ticked all of the right boxes. The only thing is that the matte white finish is actually more of an off-white – I think maybe I’d have been better with the gloss finish, which is true white and would match the fireplace, bath, woodwork and ceiling. God. It’s a right faff to send it back though and they don’t have the size I want in gloss, which would mean ordering another from somewhere else and OH! I can’t stand another mirror debacle – I’ve had it up to here with them!